Lzzy Hale has been blowing the minds of audiences all over central Pennsylvania since she began her love affair with music at age 13. With one-of-a-kind vocal abilities and versed in both piano and electric guitar, she is determined to make music her life and career. 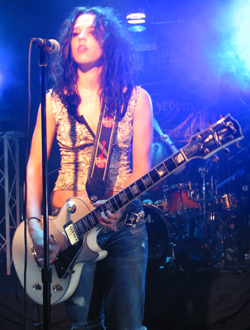 Lzzy lists influences such as Heart, Metallica, Led Zeppelin, Sevendust, Pat Benatar and Alice In Chains. Her goal, with help of her constants, Joe and Arejay, is to create a new wave of Rock, and shake the genre!